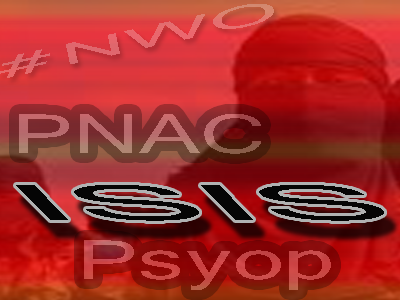 Why Does the Whole "ISIS" Thing Fit In So Perfectly With The PNAC Plan? Here are some simple burning questions whose answers can only be described by the globalist plans for a new world order. These questions strike at the root of the question all of humanity is asking: Who is ISIS ? 7. Who is their leader and how did he learn to outsmart the world's greatest military and outperform all generals in U.S. history? 15. Why does everything ISIS do fit in so perfectly with the Bush Neocon Project For A New American Century?- Why does it fit in so perfectly with the globalist new world order plans like a perfect fitting shoe or glove?? As we contemplate these questions let us remember that the mainstream media in America is controlled by only 6 companies and all of them are on the same page when it comes to Israel, the global government agenda, the U.S./U.N. led new world order plans, the Project for a New American Century, the wishes of the Council on Foreign Relations and all CIA (Mossad) backed operations. It's all part of the same story and the same paradigm. So while the mainstream media continues to lie and spin stories designed to make you think that ISIS is a mysterious and dangerous gang whose defeating can only occur with more bombing of Iraq and illegal invasion of Syria, don't forget that no "army" exists to make headline news that challenges massive empires without massive support. There are no trees that grow guns, bullets and other weapons, they must be supplied by someone. The same can be said about all resources including money, food, shelter, water and other basic needs of life. Everyone who works for a living and anyone who is struggling or has struggled financially to survive can appreciate this. Let us not be fooled by artificial engineered western media narratives that not only fit in perfectly with the globalists stated goals of taking over the Middle East clearly outlined in the Project For A New American Century paper titled Rebuilding America's Defenses. From a common sense point of view, it isn't very difficult to see how the ongoing mainstream media narratives about ISIS no longer makes any financial or practical sense from a day to day/daily-living point of view.